A few weeks ago, one of the Facebook groups (Cake Shop Uganda) that I am a part of launched a massive campaign. The Facebook group created to link cake customers with bakers and the other way round is one of the biggest thriving Facebook Groups turned communities in Uganda. The campaign was to raise awareness about mental health and buy an ambulance for a Mental Health Facility located in the suburbs of Kampala. The drive was to raise Ugx 100 million to buy the ambulance among other things. The idea was that the members of this Facebook group who are more than 100,000/- if each contributed Ugx 10,000/- , we would be able to reach the target. By the end of the month – over 400 members had contributed and over Ugx 10 million had been realised. The method of collection was simple – send Mobile Money to a certain number. It was simple and easy to do. Depending on how much one is sending, the cost of sending money and receiving was affordable. But as of today, things have changed – the social media that was being used to mobilise is being taxed and so is the method of collection. Starting July 1, 2018 the government of Uganda put in place a New Excise Duty law that has seen Mobile Money Transactions being taxed 1 %. The same Excise Duty had introduced the Social Media Tax. Persons engaging in Agriculture will be paying withholding tax of 1% while all winnings of gambling will be paying 10% of their wins as tax. The effects today were very noticeable. 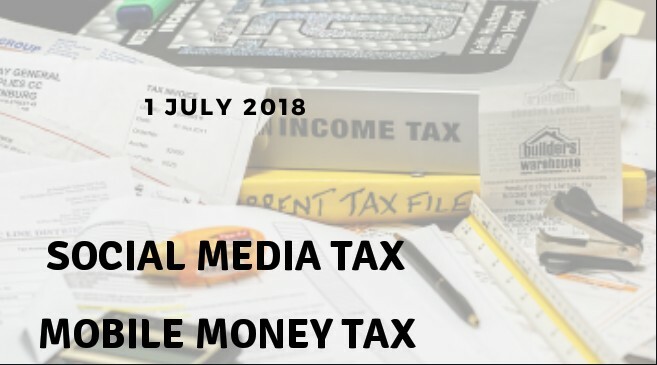 As of July 1st, WhatsApp groups were quiet and many on Twitter and Facebook were lamenting about the role and use of the Social media tax. Most of the digital natives and migrants are using VPNs to be able to bypass the social media tax and it has been working so far. The tax is paid via mobile money and one can pay for a day, week or month. What this social media tax means is that the community and sense of belonging that comes with being online has been affected. The Facebook group that brought together members to contribute to a cause is no longer going to be able to do that because one has to factor in the tax before engaging in such a drive. And the truth is, it makes it expensive. Also important to note is that social bundles given by Telecom companies for normal everyday people to access Whatsapp Twitter and Facebook have been scrapped. This is because theywere low cost. But with the tax, the Telecom companies don’t see any value in having them. The fact that we were able to go online and take part in hash tags like #SpainIsNotUganda or the usual fights between Kenya and Uganda over Migingo Island is something that we can begin to say goodbye too. The mobile money tax isn’t any more different. Someone sending mobile money to their grandmother in the village has been affected. I saw a message on one of my friend Whatsapp status that generally runs a catering business online saying that from now on its cash transactions – one can only use mobile money if they are able to foot the tax by them selves. This mobile money tax is bad for business. Sending someone 2 million ugx in mbarara,you might as well wake up and take a bus, drop the money and come back (ofcourse I held time constant)🤔but yeah it requires about an extra 50k yet transport would be 30k. The new Excise duty policy is more than a pain in the neck for most Ugandans. The government argues that this is supposed to generate revenue for the country – but is this really so? For a long time, Africa has boasted of leapfrogging in tech and financial inclusion. That assumption was made primarily because of Mobile Money being that mainly EastAfrica was thriving in that regard. This Mobile Money tax will affect everything : Payments for electricity, water, goods and services among others. I am actually worried that there are going to be no people using Mobile Money. Banks had just started using Mobile Money Agents as Banking Agents. Mobile money agents had just been trained on the same to be able to bridge the gap between traditional banking systems and mobile money services. Now this is all going to be affected. So, we are back to Stone Age. Because with Uganda’s economy woes – one would rather avoid the expense than lose money.